If you look at the modern game of golf, you will see that golf courses are longer, equipment (balls and clubs) allows us to hit the ball farther, yet the scores of both touring professionals and amateurs are not coming down. With the latest in technology—lighter shafts, bigger heads, etc.—how can golfers hit the ball better yet not score any better? The answer is simple: putting. You can hit longer drives and closer irons, but if you can’t make the putt, your scores will never come down. Golfers spend countless hours getting fitted for clubs from driver to wedge, and most of the time it helps their ball striking. So why not take the time to get fitted for arguably the most important club in the bag, the putter? The simple answer is because you don’t know you need to be fit for a putter. Almost all putters for sale today are 35-inches long, have a lie angle of 71 degrees and a loft of 4 degrees. However, telling every golfer that he or she has to use the same putter is ridiculous. Everyone is built differently, and in order to play to your potential, you should be playing with a putter that fits you instead of adapting to a putter fit for the masses. But what constitutes a custom putter fitting, and how do you know if you are really getting custom fit or simply told you are getting custom fit? 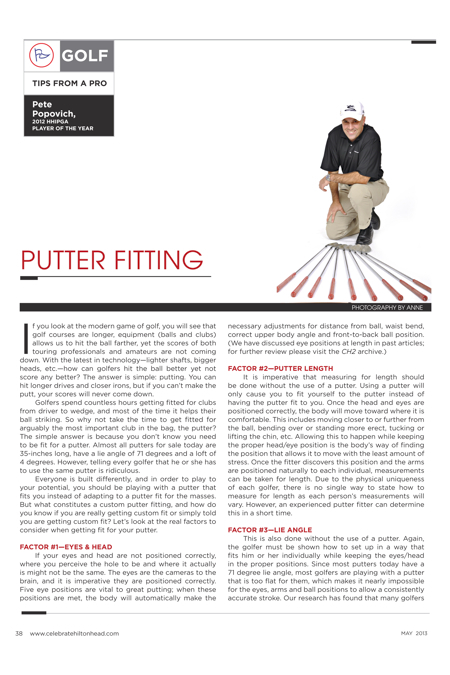 Let’s look at the real factors to consider when getting fit for your putter. It is imperative that measuring for length should be done without the use of a putter. Using a putter will only cause you to fit yourself to the putter instead of having the putter fit to you. Once the head and eyes are positioned correctly, the body will move toward where it is comfortable. This includes moving closer to or further from the ball, bending over or standing more erect, tucking or lifting the chin, etc. Allowing this to happen while keeping the proper head/eye position is the body’s way of finding the position that allows it to move with the least amount of stress. Once the fitter discovers this position and the arms are positioned naturally to each individual, measurements can be taken for length. Due to the physical uniqueness of each golfer, there is no single way to state how to measure for length as each person’s measurements will vary. However, an experienced putter fitter can determine this in a short time. This is also done without the use of a putter. Again, the golfer must be shown how to set up in a way that fits him or her individually while keeping the eyes/head in the proper positions. Since most putters today have a 71 degree lie angle, most golfers are playing with a putter that is too flat for them, which makes it nearly impossible for the eyes, arms and ball positions to allow a consistently accurate stroke. Our research has found that many golfers are better suited when their putters are more upright. How much more upright depends on the golfers physical build: arms, torso, and leg length. Almost every putter today is sold with 4 degrees of loft, the normal logic being that the putter head has to lift the ball out of its small depression on the green so it can get rolling ASAP. Nothing could be further from the truth. In fact, it has been proven that 0-2 degrees of loft reduces the amount of a putted ball’s skid by up to 7 percent. This means that with less loft, the ball starts rolling sooner, which allows the putt to stay on its intended line better. If a putter has more than 2 degrees of loft, the probability of the ball bouncing or skidding before rolling increases, while the chance of the ball staying on line decreases. Once a golfer’s measurements are taken without a putter, calculations can be made for the fit of the putter to the individual. Then and only then should a test putter of chosen length, lie and loft be given to the golfer to try. If the test putter does not produce the desired results or feel right to the golfer, a final putter based upon slight modifications to the above factors can be made until theory and reality become one. A proper custom putter fitting encompasses matching a golfer’s neurology and physiology with the club’s total geometry. It sounds complicated, but it is very simple to someone who knows how to apply and combine each aspect into a total fitting. If a putter fitting process does not include all of these factors, (or only uses electronic measuring devices), you might want to re-think the value of the fitting. We do not recommend electronic measuring devices because 1) these devices do not tell you how to fit someone; they only tell you what is happening in the stroke, and 2) they do not take into account all three of the sciences mentioned above; they only work with geometry. Our fitting process takes into account all of the aspects mentioned above and how they apply to each individual. We work with the physical differences of each golfer so that he or she can start making more putts and enjoying the game to a greater degree. If you would like to get custom fit for your putter or if you have a question about custom putter fitting, contact the GPA-HHI at (843) 338-6737, pete@golfacademyhiltonhead.com, or on Facebook at Golf Proformance Academy-Hilton Head.